India occupies a strategic position in Asia. It is surrounded by China, Nepal, Pakistan and Bangladesh. To its north is Russia. As is well known—the Twentieth century was the American Century but the Twenty First century is going to be the Asian Century. But achieve it we have to eradicate geopolitical wars and rebuild the weak nations in Asia. India and China were the two richest countries in ancient times and according to Angus Maddison, the two largest economies by GDP output till the Eighteenth century. India excelled in various fields and its golden age was the Gupta period in 6th century AD. The British who colonized India for 200 years sent back to Britain huge amounts of money from India and it became poor. During the Bengal Renaissance in the Nineteenth Century, people like Rabindra Nath Tagore tried to rediscover India’s glorious past through literature, painting and music. He established contact with Chinese scholars. Reformist religious movements led by Sri Aurobindo and Vivakanada instilled a feeling of nationalism and pride and the seeds of revolt against the British were sown. The British left India in 1947 and divided the country into two and Pakistan was born. Acrimonious relations began between the two from the time of Partition. India and China developed very cordial relations after Independence under Nehru. But there was a war in 1962 on the boundary question that had been drawn by the British. But since China and India have a long history of peace, harmony, sharing of culture and philosophy, they have rebuilt good relations. The BRICS brings China and India closer together as it gives them a platform to resolve their problems and take a common stand on various global issues. Recently Indian Prime Minister Narendra Modi went to China and President Xi Jinping gave him the Tang Dynasty welcome in his hometown Xian. 24 inter-governmental agreements were signed worth $22 billion in investments involving cooperation in various fields. The need for peace and tranquility on the border was recognized as an important guarantor for development and continued growth of bilateral relations. A huge ($70 billion) amount of bilateral trade takes place between the two countries and India has a trade deficit of $38 billion with China—a matter of concern for India. A breakthrough was reached between the two countries on the cultural front. Modi visited the Wild Goose Pagoda which was built to commemorate Xuan Zang, an ancient Chinese monk who went to India for Buddhist scriptures. In Beijing, in the Temple of Heaven there was a Yoga-Taichi event. Three Indian monks taught and promoted Buddhism there 1400 years ago. A programme on Gandhian studies was introduced in Fudan University. China can help India in building infrastructure and in skill development. MOUs were signed in diverse fields like railways, skill and vocational training, mining, establishment of India-China think tank forum, climate change and ocean science. The two governments established sister towns and states in both countries. India can help China in many ways especially in IT, software and pharmaceuticals. India and China together can help in the reconstruction of one of the poorest countries in the region, Nepal. India and Nepal have been closely bonded since 1950 and today there is virtually no border between the two countries. India and Nepal are members of (SAARC) South Asian Agreement for Regional Cooperation where China is an observer. Today Nepal is faced with extreme poverty and underdevelopment. Nepali people are still mostly engaged in low productivity agriculture which generates low incomes. It has a small manufacturing sector but it has a fast growing service sector. Nepal scores higher than India in World bank’s ‘Ease of doing business’. Nepal, a country squeezed between two giants has to be friendly with both. There is a big shortage of power, infrastructure and job opportunities. Nepal’s migrant population sends home remittances which form a big part of the GDP. Nepal has unparalleled natural beauty, a big potential for tourism and mighty rivers for generating hydro power. It is a repository of rare and diverse biological species. It is mainly a mountainous region and has a shortage of arable land. But there are areas where three crops can be grown. On the whole it cannot be a big exporter of agricultural produce but natural honey, rice, vegetables, herbs and fruits grow in abundance. Nepal’s northern neighbor China is facing problems of rapid growth and high rate of urbanization. After three decades of double digit growth, it is facing economic slowdown, ageing population and problems of food safety. Its manufacturing growth has slowed down due to slack global demand and high labour costs. The Chinese government is also deliberately turning away from export led growth and concentrating on increasing domestic consumption and raising people’s incomes. China is facing excess capacity in its industrial units and infrastructure but is also looking for outsourcing some of its production to remain competitive. Nepal can fill that role and become a base for assembling machine parts and components which is becoming more expensive in China. China is aiming at a more equitable distribution of income and balanced growth between towns and villages. Agricultural production has become a major concern and China needs to focus on the quality of produce. There have been many cases of adulterated and contaminated food due to the presence of heavy metals on account of environmental pollution. Nepal though it is also an importer of rice can help in supplying ‘safe’ horticultural products. There can be investment by China in Nepal’s agricultural production for it to become a major supplier to Chinese markets. China can encourage migrant labour from Nepal to work in its agricultural sector as Chinese villages are facing a problem of shortage of agricultural labour. China will be faced with a severe food problem in the future if people keep moving away from agriculture to manufacturing. It has 20 percent of the world’s population but only 7 per cent of world’s arable land. Nepal’s physical closeness to Tibet is a plus point. Transportation of food via Nepal to Tibet is easier for China and it can set up food processing and packaging industries on the border between Nepal and Tibet. China’s help in infrastructure development in Nepal’s northern region can help boost Nepal’s own exports to China. 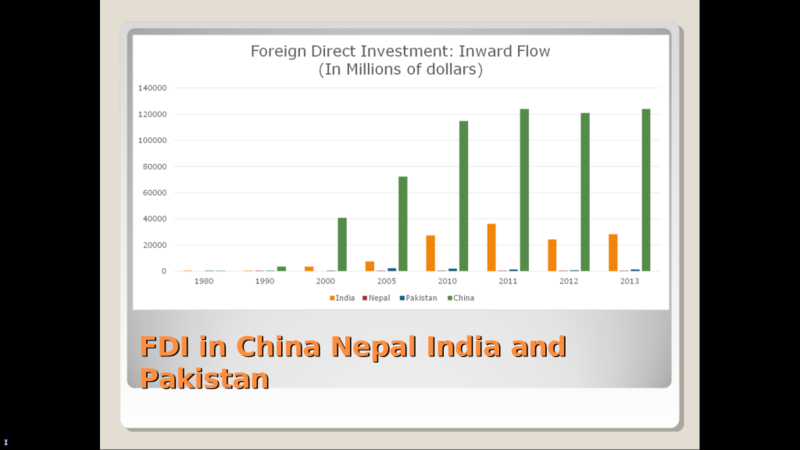 Nepal can also attract more FDI from China which can help in its development and growth. Nepal’s southern neighbor India is its biggest partner in trade and investment. India’s manufacturing growth has recently picked up after a period of stagnation and the Index of Industrial production (IIP) was at 8.4 per cent in the last quarter (January-March 2015). Its service sector growth is at 10.1 percent. India’s trade surplus ($2 billion) with Nepal is of great concern to the Nepali government. It can be reduced by increasing exports through a smooth land route to India. India’s trade deficit with China can be reduced if there is a good road to China via Nepal. Proper infrastructure will lower transport costs between all three countries. India can outsource some of its production to Nepal which has lower labour costs. There is no language or financial transfer problem between the two and many Indian industries have invested in Nepal. India can set up SEZs [special entreprise zones] along Nepal-India border that would benefit both the countries. In hydro power and tourism, the possibilities for joint ventures and cooperation are immense. Thus Nepal can leverage the rapid growth on both Indian and Chinese sides due to its strategic geopolitical location, and ask for infrastructural assistance. There can be joint enterprises on both borders. For future collaboration between India, China and Nepal, the investment climate in all three countries, especially Nepal and India, has to change. Both need more investment friendly policies with long term vision and strategy. Nepal needs political stability, strengthening of legal institutions and bridging other policy related gaps. Nepal can become a New Transit Point economy between India and China. To be able to do so, already 19 sectors with potential for good export performance have been identified. India has to give easier access to Nepali goods and help build its physical and social infrastructure which will help in poverty reduction. The trilateral cooperation between India and Nepal and China can enhance the living standards of the region. With a total population of around 2.8 billion people, the trilateral cooperation can lead to the emergence of a huge trade and investment bloc in the world. Pakistan is India’s most problematic neighbor. Both India and Pakistan have large numbers of people living below poverty. Yet the two countries have gone to war three times. Pakistan is also a member of the SAARC, yet trade between India and Pakistan is small at $2.3 billion and fraught with many problems with the gains from trade being denied to the people on both sides. There is still hope that with Prime Minister Nawab Sharif, trade and investment relations between India and Pakistan will improve. Prime Minister Modi invited Nawaz Sharif to his inaugural ceremony in May 2014. India has agreed to give free access to 300 of Pakistan’s export items and has made visa process easier and eased the norms of opening banks in India. While the normal trade has suffered, informal trade has flourished. The informal trade is more than $1 billion and it has a smuggling component as well as a third party component in which trade from India travels via Dubai or Singapore to Pakistan. Smuggling means a loss to the exchequer for both countries and for third country trade, the consumers suffer because transportation costs lead to higher prices. Both countries have low human development indicators, rise in terrorist activities and low per capita incomes. India granted Pakistan Most Favoured Nation (MFN) status in 1998 but Pakistan is still dithering and though the likelihood of its agreeing to give India, Non Discriminatory Market Access (another name for MFN) status has increased, it has not yet happened. If Pakistan gives NDMA to India it will automatically lead to bringing down tariffs and giving Indian goods the same treatment that it gives to others. Pakistan however has moved from the positive list of 2000 goods that could be imported to a negative list of about 1200 items that cannot be imported. With acrimonious political relations for decades, the hope that trade will bring about peace is a difficult goal. India is sour with Pakistan on many counts –especially about the Mumbai blast of 2008 in which Pakistan has refused to charge the accused, and its escalating nuclear programme. Though a train service was started between Lahore and New Delhi, it has not been successful. There are fears of Pakistan-sponsored terrorism in India and there is deep suspicion of any political move to grant concessions to Pakistan. Although foreign direct investment from Pakistan has recently been allowed into India, not much has come. Indian investment in Pakistan is also insignificant. The cause for this slow movement of investible capital across the borders is the lack of investor guarantee. Also, the problem of transferring money across the border — especially from India to Pakistan remains. There are many possibilities for joint ventures that would be beneficial to the people on both sides, like food processing industries and IT, but there is very little forthcoming because of the perceived risk to capital. Unless this problem is solved, more job creating investment cannot take place. While business contacts between the two countries are increasing, the governments’ stand remains cautious and restrained. Though the current trade volume is lower than its potential at $2.7 billion, there is scope for increasing trade to $10 billion in the next few years. Pakistan’s exports remain small at $541 million. There are few good roads that can be used for trade between India and Pakistan and there are problems in rail transport. In April 2012, the two capitals launched a new integrated checkpoint at Attari-Wagah land border crossing which could increase trade through this sector at least tenfold. Both sides have also concluded a landmark visa agreement that loosens travel restrictions. India is no doubt the biggest economy in the region and the smaller neighbors have reasons to feel threatened. India can encourage its business communities to be at the front line of trade liberalization. More contact between the Chambers of Commerce from both sides could dispel fears and usher in more cooperation. There is no doubt that producers would be happy importing low cost materials from either side. India has to be liberal in allowing Pakistan to access third countries like Nepal, Bangladesh and Bhutan via its territory and Pakistan should give transit rights to India to access export markets in Afghanistan. This is essential in furthering regional trade that will include China, Iran and Turkey in the future trade orbit. Better infrastructure at the border like more warehousing, X Ray machines and testing laboratories are needed. Both sides should remember that security and political tensions should not spill over into economic relations because thousands of lives are dependent on it. Suspension of trade due to isolated terrorist attack can be counter-productive and will lead to more fractured bilateral economic relations between two immediate neighbors. Like in Nepal, China has been helping Pakistan for a long time. China’s investment in Pakistan on infrastructure of $46 billion recently has caused alarm in India. China is trying to open new trade routes between China and Central and South Asia and to develop the Pakistani port of Gwadar. China’s move is both economic and strategic and is likely to benefit the entire region by opening routes of connectivity between Asia and Europe. Thus. the Asian century will happen if the geopolitical conflicts are eliminated and developing countries like Nepal and Pakistan are helped out of poverty by their big neighbours India and China. India, China and Pakistan spend millions of dollars on defence, which can be redirected to development and making this an Asian century.